It’s been three weeks since I was in Melbourne but I haven’t been able to stop thinking about the amazing fish I had at Bottega. I think – and this is a big call – that it was the best dinner I’ve EVER had. Being a bit of a restaurant dilettante it’s also a big call to say that I think it may be the nicest place I’ve dined. But I think it’s a call that I have to make. Mel did a full blog post about Bottega that you can read here. However I need to show you my meal. Being the best meal I’ve ever had, it really deserves to be featured on my own blog. I forgot to take a photo of the bread they served, so you’ll just have to take my word for it – it was Really Good Bread. And I never use title case incorrectly so you know I’m speaking the truth. It had a lovely, chewy crust and a moist, soft centre. The waiteress came back later to offer us another piece, which I turned down. Biggest mistake of my life people. No other bread will ever compare. Anyway, I digress. This is the fishy. It’s a pan seared barramundi served with black rice, parsnip puree and salsa verde. Dessert for me was a trio of house made sorbet, raspberry, strawberry & passionfruit. Cleansed my palate perfectly. The question now of course is whether to go back next time I’m in Melbourne? What if I return and it doesn’t live up to my expectations? And would I order the same fishy dishy or try something different? It’s such a tough, first world problem to ponder. In the meantime, I’ve been cooking a lot fish. Not to try and recreate the Bottega meal, but just because I was reminded how delicious and versatile it is. Last Friday night I made steamed blue eye with black beans from Neil Perry’s Balance and Harmony cook book. You can scroll to the end of the post for the recipie, but I will advise cutting the soy and shaoxing by half. The black beans were far too salty. That greenery in the background is meant to be beans and bok choy. I totally oversteamed the bok choy though so it was more like flop choy. I made the prawns from a sambal recipe in Adam Liaw’s new book, Two Asian Kitchens. I’ve only ever watched one episode of Master Chef (with the Sporles) but that episode was all it took for me to develop a crush on Adam. So talented, so cute and as his tweets now show, he’s pretty sweet and witty too. 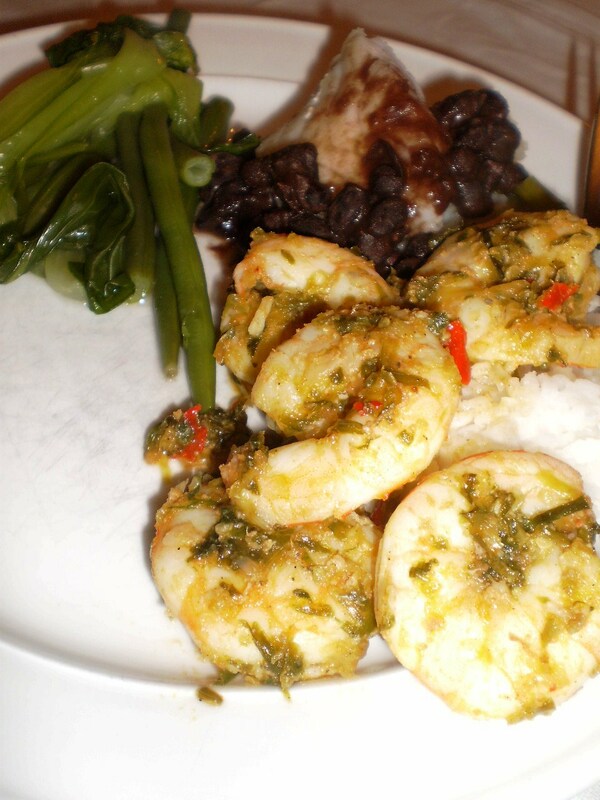 Anyway, I’m digressing – the prawns were hot, hot, hot and yum, yum, yum. Not for the faint hearted, that’s for sure! While I was making the sambal assam that you stir fry into the prawns, my nostrils started to burn. Felt like a fire in my nose, which I kind of liked….but then, I’m weird like that. Put the green onion in a large shallow heatproof bowl and place the fish on top. Combine the black beans, soy sauce, and Shaoxing and pour over the fish. Put the bowl in a large bamboo steamer over a saucepan or a wok of rapidly boiling water, cover with the lid and steam until the fish is just cooked through (7-8 minutes). Carefully remove the bowl from the steamer. 1) Heat oil in a wok over medium-high heat until smoking. Fry the onion for 2 minutes or until softened but not browned. Add the prawns, stir fry for about 1 minute or until starting to turn opaque. 2) Add the sambal assam (below) to the wok and simmer for 2-3 minutes until the prawns are cooked through. 1- Put the tamarind pulp in a heatproof bowl and add 250ml boiling water. Leave to cool, stirring occasionally, for about 10 minutes until the water is cool enough to touch comfortably. Strain the tamarind liquid, pressing the solids with the back of a spoon to extract as much liquid as possible. Scrape the bottom of the strainer into the liquid, and discard the solids. 2 – Combine the eschalots, chillies and garlic in a food processor and process to a rough paste. Heat the oil in a saucepan over medium heat, add the paste and reduce the heat to low. Cook the paste for 10-15 minutes, stirring regularly, until much of the moisture has evaporated and the mixture is fragrant. 3- Add the tamarind liquid, sugar, salt and shrimp paste. Cook, stirring occasionally for 10-15 minutes. Store in an airtight container in the freezer. 1) This photo that Gavin posted on my facebook wall. 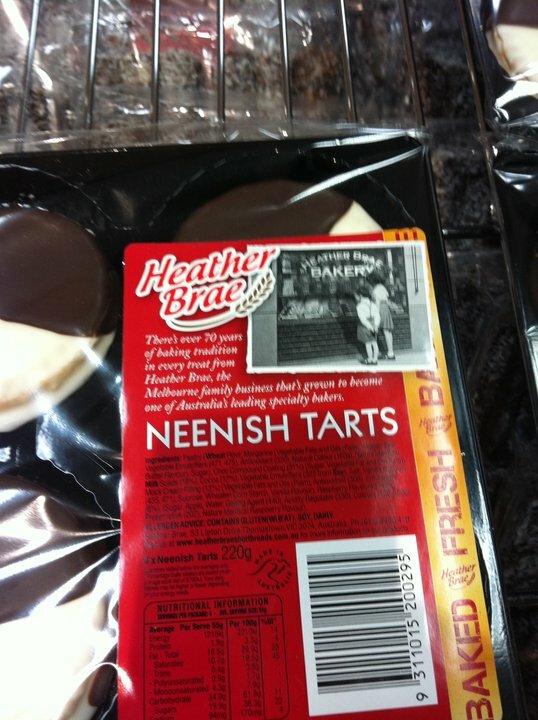 I’m a tart! 1) The last weekend in July when Donna, Ella, Sheela and Kylie come to stay!!!!!!!!!!!!!!!!!!!!!!!!!!!!! I can barely think about anything else! 2) Going to The Dip for dinner club on Thursday. 1) An irrational reaction I had to something this weekend. 2) Noisy people on the train. 1) Safe travels for my sister and her family. 2) A stress free work week. All images from my Pinterest boards, here. I love browsing through the gift shops in museums. It seems that as a general rule, they tend to stock lots of interesting and quirky things that you never see anywhere else. When I was in Melbourne’s ACMI store the other week, I came across the delightful Madz has Runaway collection. 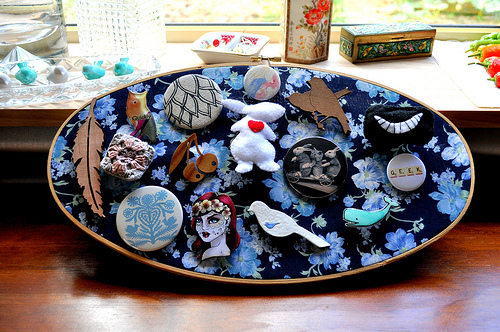 Madeline’s a Melbourne girl who uses timber and fabrics to make her range of brooches, earings and necklaces. 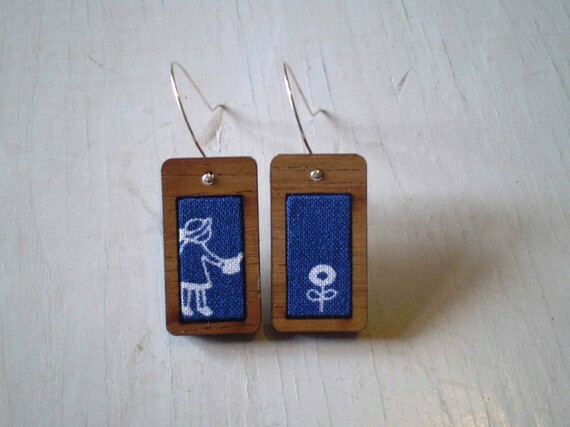 I didn’t buy anything at the time, but to my delectation I have discovered that Madz has an esty store! 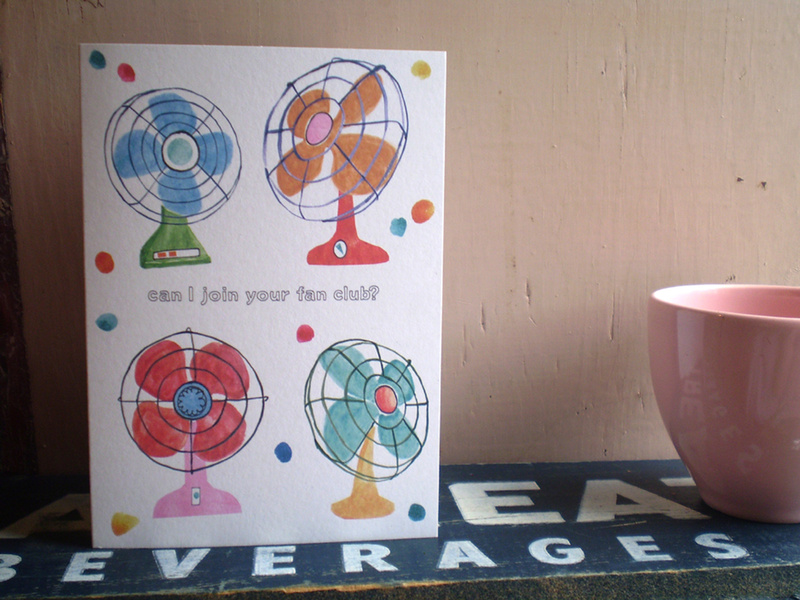 Turns out she also illustrates nice cards too. You can see her labours of love here. 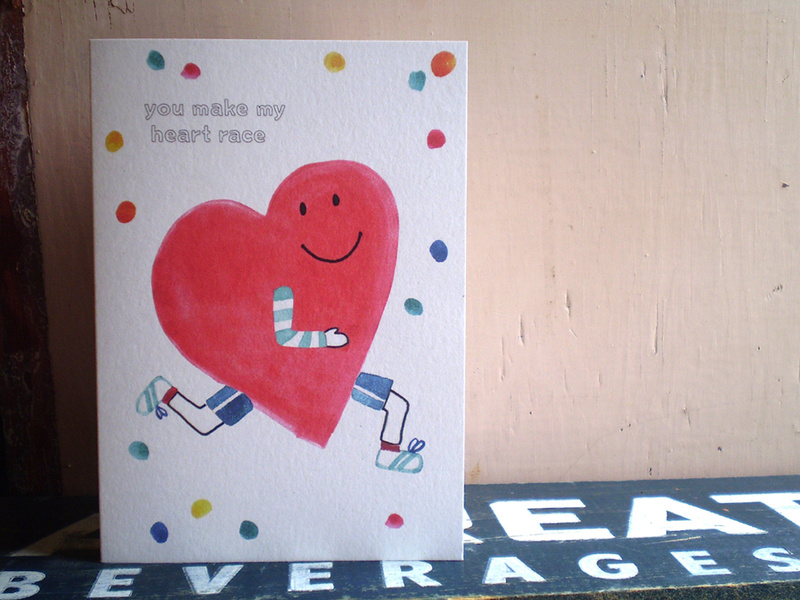 Did I mention all her work is super cute? Well, it is. 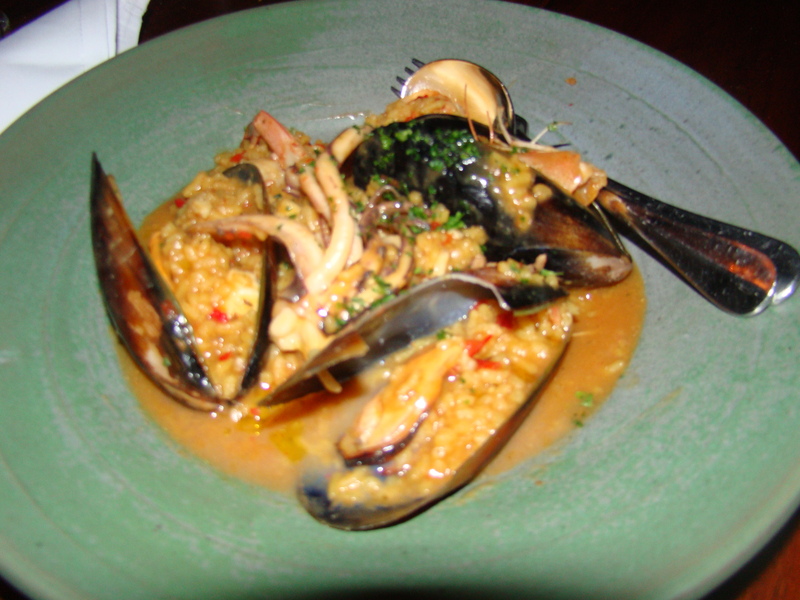 One of the things I was most looking forward to about our long weekend in Melbourne, was dining at MoVida. I’ve always heard such good things about it. It gets great reviews, it wins lots of awards, you have to book months in advance, they’ve opened three additional restaurants to cope with demand and they have a hugely popular cook book. Did it live up to the hype? Well, I have to say that for me, it didn’t. Maybe it’s because my expectations were too high. Maybe it’s because I’d had the best meal of my life two nights before. Or maybe it’s because every time I have tapas, I realise I don’t actually like it that much. Now don’t get me wrong. We did have a fabulous night there. At our table there were good stories being told, funny games being played and chickens being made out of napkins. But the thing is, I didn’t walk away with a desire to go back. While most of the food was nice, I’m just not sure I’d really recommend it to anyone as a ‘must dine there’ experience. I’m sceptical that the hype about MoVida’s is warranted. The name: MoVida is named after the art and film movement that flourished in Madrid during Spain’s reawakening in the 1970s. The chef: Frank Camorra, originally from Barcelona. The location: 1 Hosier Lane, just past MoVida Next Door. The laneway is really quite cool. There’s European style cobblestone and walls of graffiti. The ambience: The dining area is pretty compact and didn’t feel all that Spanish to me. I had also expected it to be busy and bustling but it wasn’t really. Although I guess that’s because we were there on a Sunday night. The service: We were left alone for a while when we first arrived but then our waitress got it together and was good to us for the rest of the evening. The price: Individually, no dish was all that expensive. But as usual when you have tapas, it all adds up and you can sometimes end up paying more than you expected. The beverages: The wine list is pretty pricey, with only a couple of bottle costing less than $50. The menu: There’s the choice of tapa (small individual dishes) or raciones (plates to share among two or more people, or a larger dish for one). They also had a few specials. There were lots of options in each category so it took us a little while to decide on our ordering strategy. The foodage: First of all, we were brought two different types of bread. One had a cheesy top and one was sort of dense and crumbly, a bit like sourdough. There was some peppery, almost bitter, olive oil to accompany it. 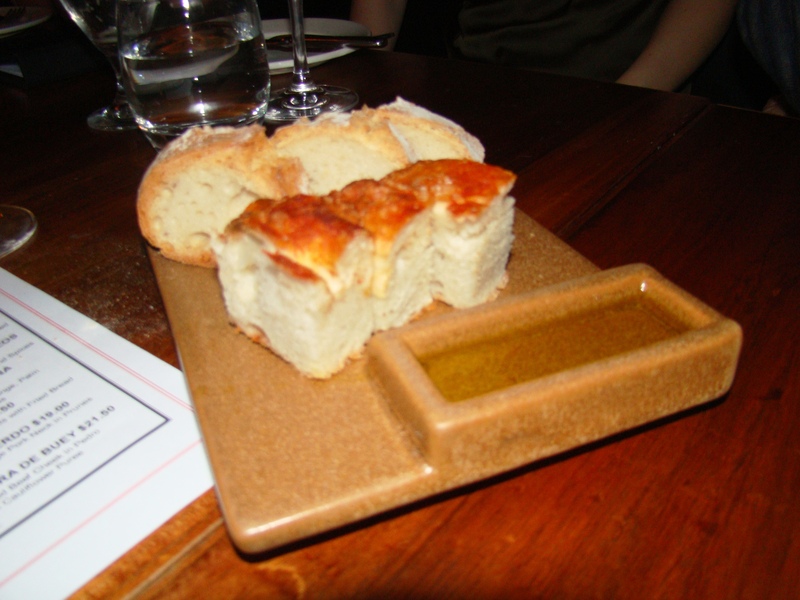 If I hadn’t had the most amazing bread EVER, two nights before, I might have liked this. 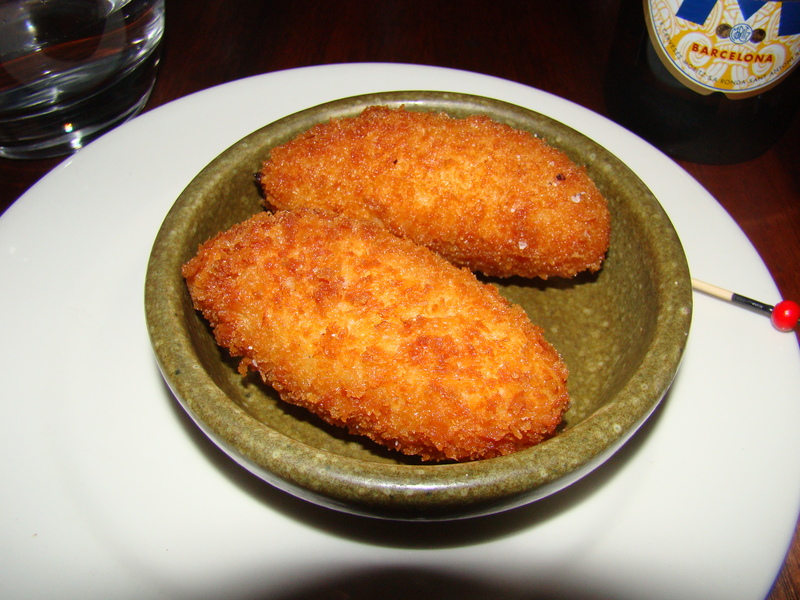 I love a good croquette, so we ordered four of the MoVida version which were fried and silky. We cut them up to share and oozing out came some deliciously smooth, creamy jamon and egg filling. I think the jamon (Spanish for ham) brought a nice smoky depth to the flavour. Mandy, Nath and I each tried one of these cubes of freshly cooked prawns. 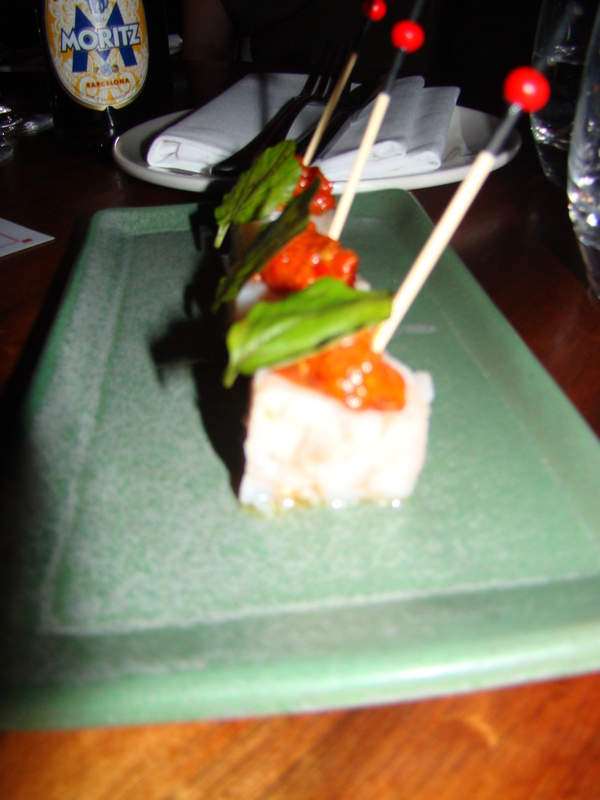 We liked the romesco sauce, which seemed to be made of pine nuts, garlic and red capsicum. However unfortunately it completely overpowered the flavour of the prawn itself. And they were a bit cold. Mel and Jay each ordered one of these Spring Bay mussels. 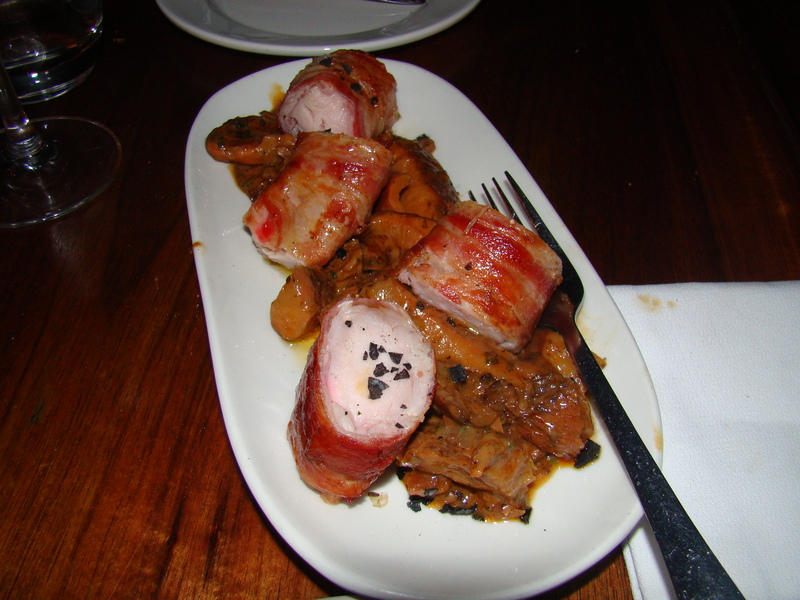 Stuffed with dried chorizo and lemon alioli , they certainly looked delightful! After I had declared to everyone at the table that olives were MY VERY FAVOURITE FOOD, it seemed important to order two serves. I guess my fellow diners were worried I’d devour every last one of them. Accompanying the large green olives were a whole bunch of tiny ones, which to me, didn’t really taste all that flavoursome. 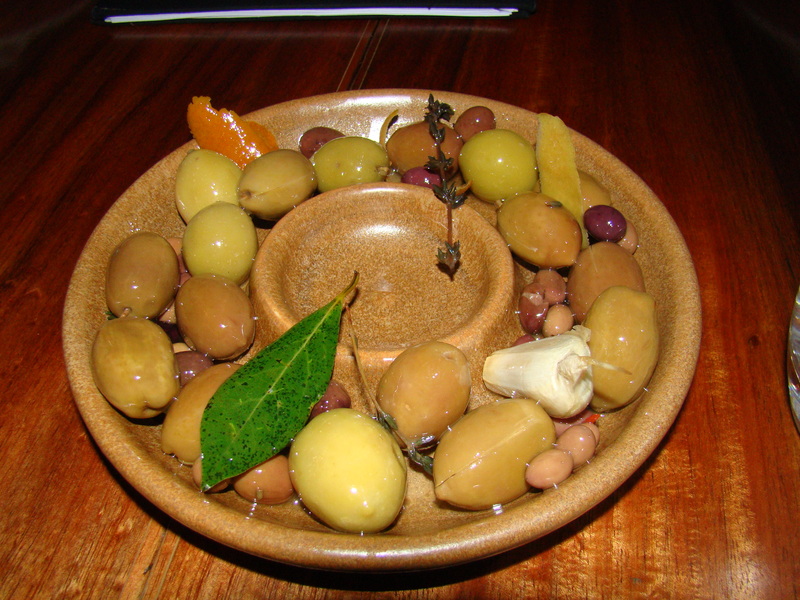 As far as marinated olives go, I’ve had a lot better. I love to eat octopus. 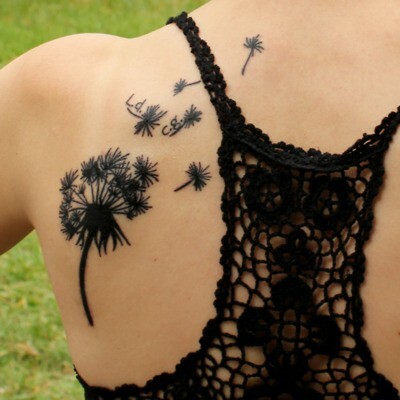 Love it! I was most excited to discover that Mandy & Nathan do too! 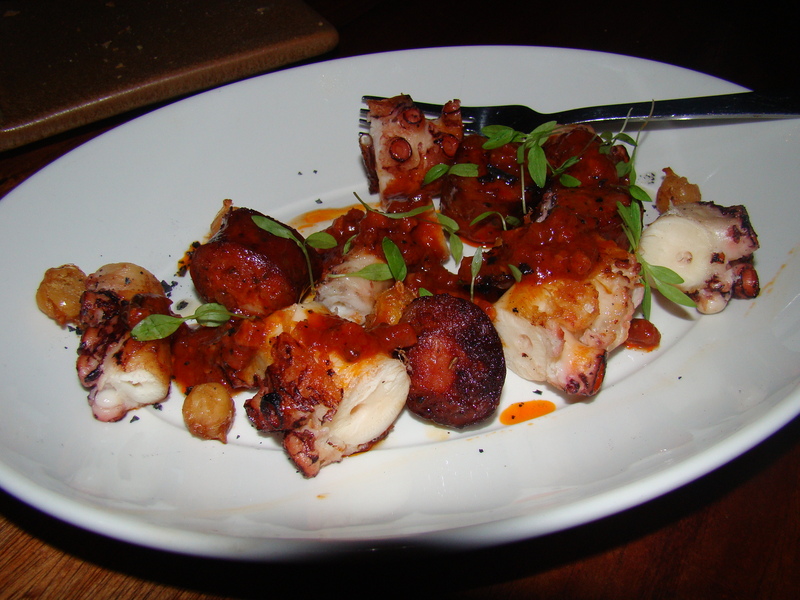 The MoVida version is char grilled and served with chickpeas and their own, house made chorizo. 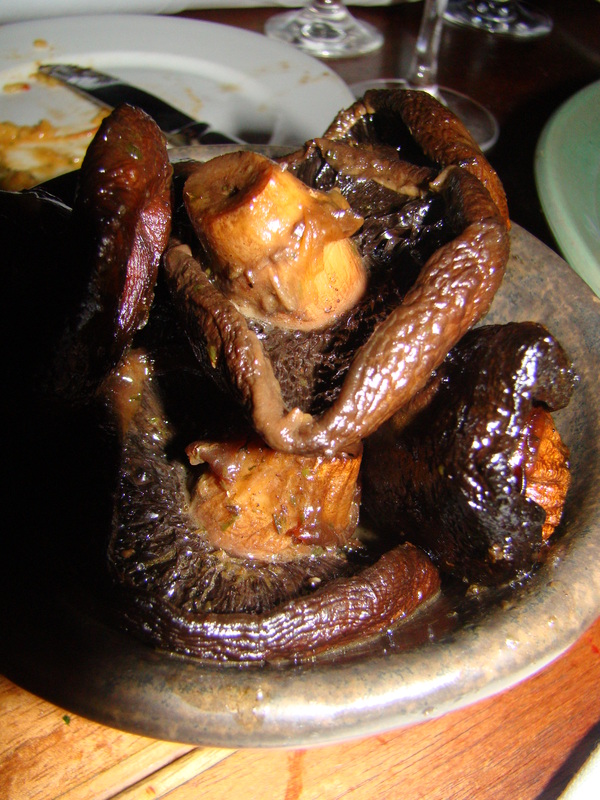 This dish was cooked to perfection – the occy were tender and intensely flavoursome. I did an undignified amount of ooohhhing, ahhiing and eye rolls of bliss. This led to Mandy kindly letting me eat the last few pieces. I must remember this trick! 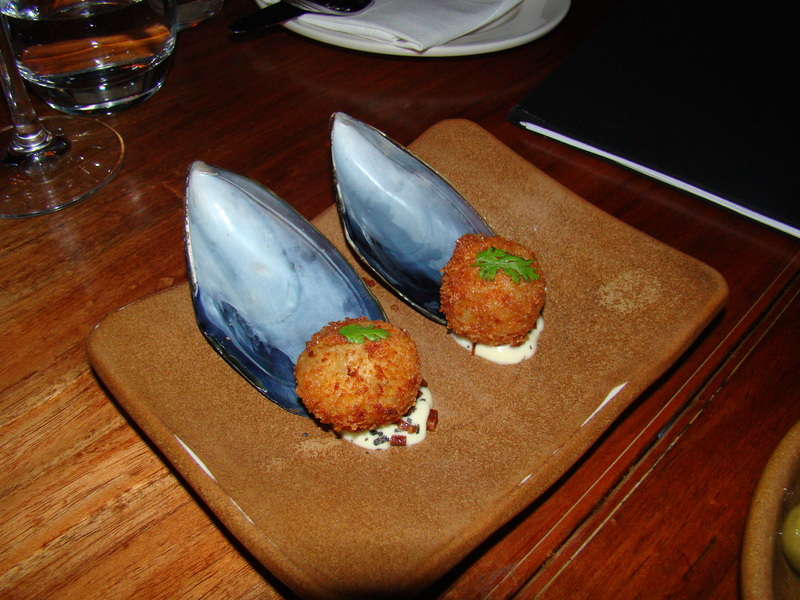 These little suckers (I had to say it) were my favourite dish the night. Bleh. I can barely look at the picture below without feeling sick. 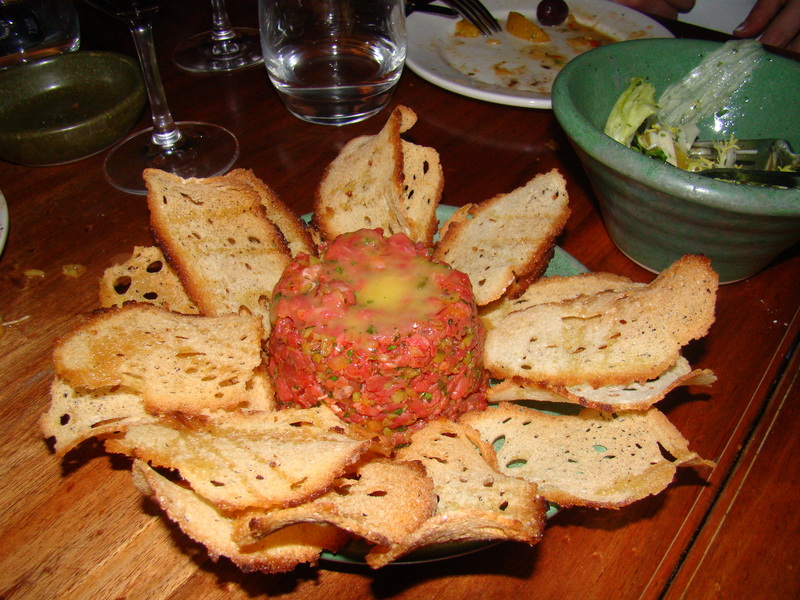 Ian loves a steak tartar but I myself am not at all a fan of raw meat. The others all tried this though, Mel and Jay being tartar fans also. The general consensus, (when I could bare to turn and look across at them eating this raw stuff) was that the wagyu was incredibly good. The chilli on top was too spicy though and overpowered the meat. My initial bite of the mushrooms made me screw my face up. They’re oven roasted in sherry vinegar and I found the flavour too strong. A few more mouthfuls though and they’d grown on me. This dish seemed to be everyone’s favourite. 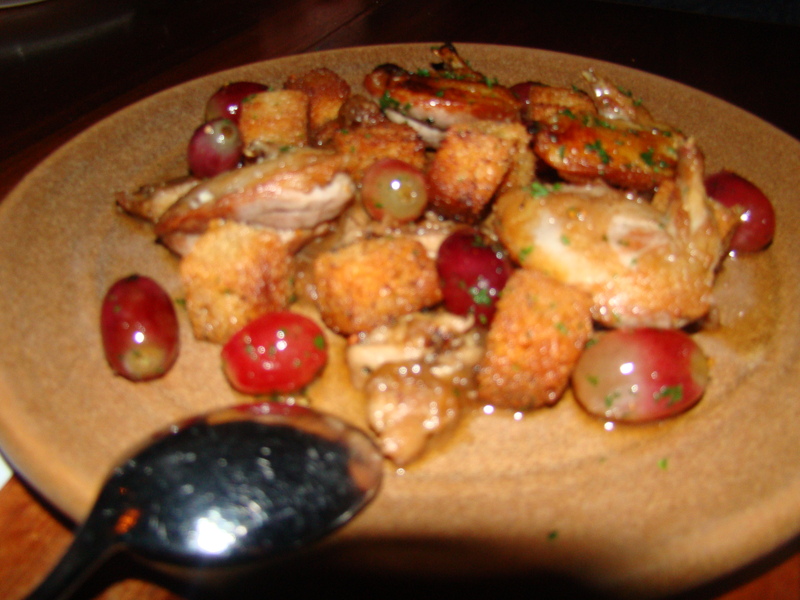 Pan seared quail breasts with fried bread and grapes. I didn’t taste the quail itself but I did like the grapes. The words ‘scrumptious’, ‘sweet’, ‘tender’ and ‘delicate’ were being thrown around by my friends and there was a whole lotta lip smacking going on. I should have asked more questions really, because I feel bad now that I am lacking in adjectives for what seemed to be the dish of the night. 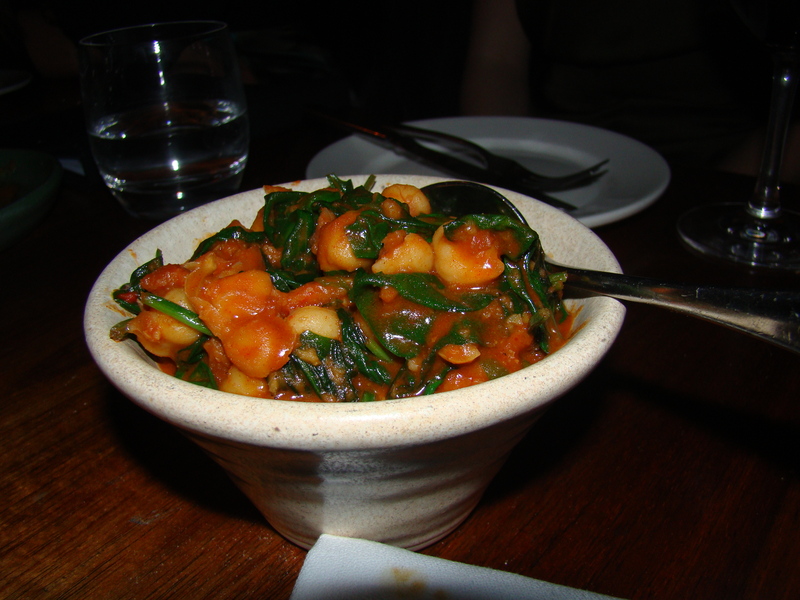 This delicious dish of sautéed spinach with chickpeas was super tasty. I loved the earthy, spicy flavours, especially the cumin. It came out at the wrong time of night though. We were just about finishing up and it felt far too filling for the last plate of the night. The only thing I’m fussy about when it comes to food is meat. I don’t like anything raw and I don’t really like anything other than beef. Sometimes I’ll eat lamb and sometimes I’ll eat chicken. But rabbit is not something I’d ever had before or had the desire to try. However before I got to MoVida I had pre-decided that I was going to be brave about at least one dish. So when our waitress told us that the tapa special of the night was rabbit, I happily agreed to ordering a couple of serves so that we could all try it. I was instantly put off when it was delivered to our table. The waitress plonked down the two dishes, saying with a flourish “Here’s the bunny”. I did try a few little nibbles but it was far too fresh and succulent for me. I know fresh and succulent is a meant to be good when it comes to meat. All I could think though was ‘I’m eating a bunny. And it’s really fresh. Freshly dead. And juicy. Bunny. Juicy. Juicy bunny’. Suffice to say, it messed with my chi, hard. I couldn’t finish my piece. I know the others like it though. Ian commented that he thought it should have been a more generous, racion serve. However I think that because it was so rich, eating more than just a tapa share could have been too much. I seriously loved this paella. We ordered two for the table and then realised it was a silly move, given that half of our group are not big seafood eaters. But seafood to me is the best food on earth so I tucked into what I thought was a perfectly cooked dish. The flavours were really simple. There was just the right amount of garlic as well as a hint of chilli. I also liked that it didn’t taste too fishy. Sometimes a heavy fish flavour really overpowers paella. This is my favourite Spanish dish so I was happy that it was cooked well. Nobody really felt like dessert except for Ian. 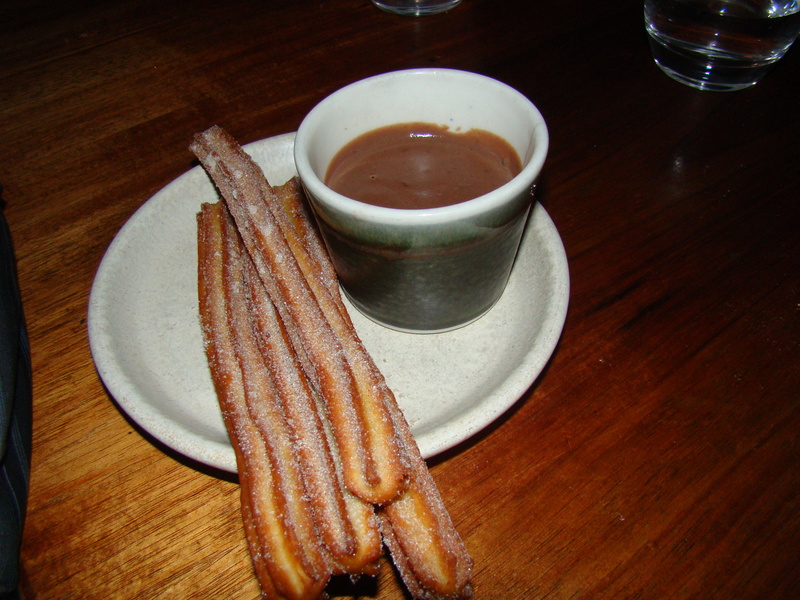 He ordered some churros and shared it around. I passed – churros to me always tastes sickly sweet. E did say though that this version was lovely. Not knock out amazing, but a nice end to the night. So there we have it. MoVidas. I’d give it about 7/10. I think Kate Spade and I are meant to be friends. 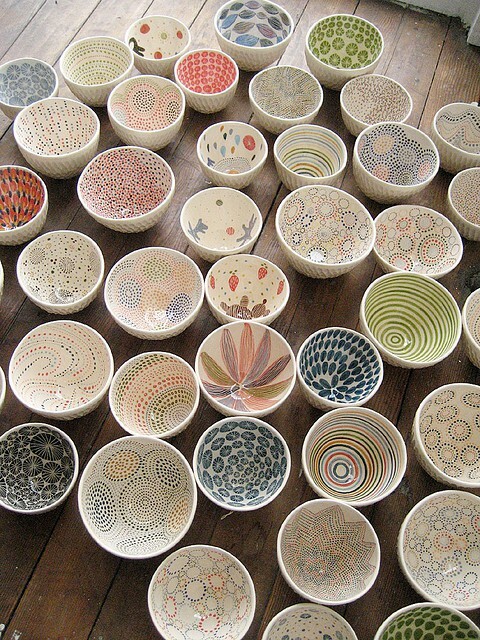 So often, whilst browsing the interwebs, I stumble across products, images and illustrations that I love. And often, they seem to be hers. So I’m thinking that great friends is what we’d be. I’m particularly loving her new Booklovers Coffee Mug. 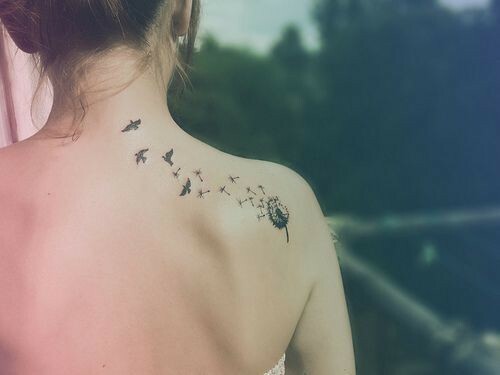 I have filed it under “Super cute, must have”. Come on Kate, ship to Australia! 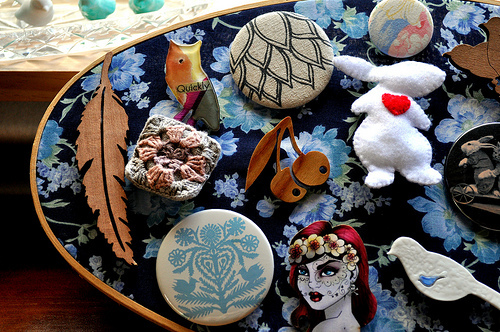 Yes indeed, please behold an embroidery hoop that can be used to display brooches. It was handmade by the crafty Jess, from Epheriell Designs. 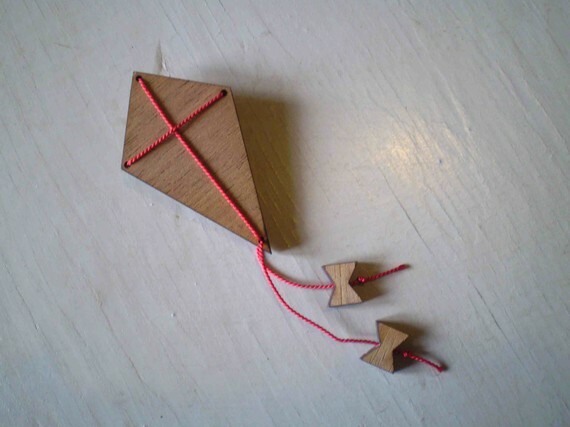 You can find the instructions on her blog, if you’d like to make one yourself. I certainly will be. 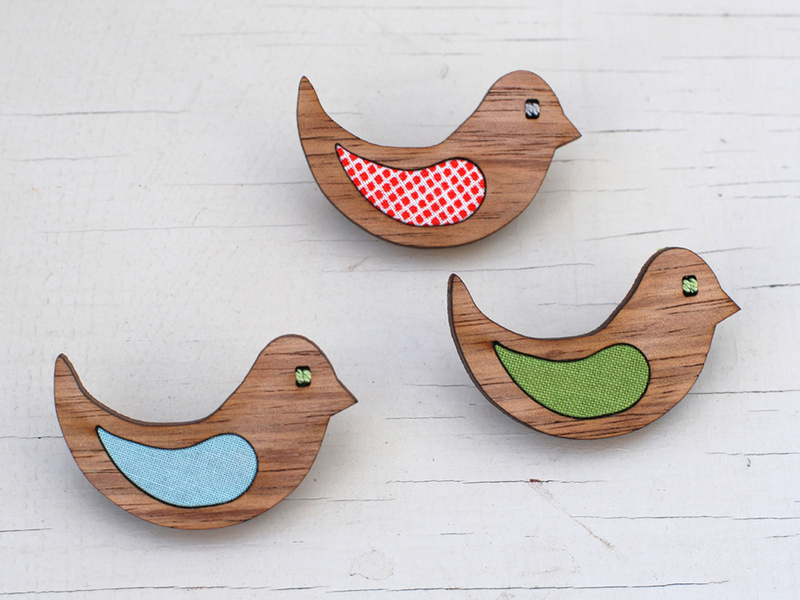 It’s just about the cutest thing you could possibly hang from your wall. Ten years ago today, I moved into my flat in Pyrmont. I’m still here and I’m still loving it. – Andrew, who, before he moved in, I only vaguely remembered as being the guy from stats classes who actually knew all the answers. On the first night he lived with me, he tried to steam whole carrots. I was slightly concerned, but he never displayed any further strange behaviour. He now lives with and dates my bestie. -Miss Raph, whose full name I could never pronounce, who had a crush on the boy at the corner store and whose entire diet consisted of tuna, beans, corn and Lebanese bread pizzas. Miss Raph and I would force ourselves to clean up at least five things each before we went to bed every night. We also used sign language to communicate when we were going to have showers. I cried the day she moved out, even though my husband to be was moving in. My favourite flat mate of all. He moved in with me a week before we got married and I’ve loved every minute of living with him. Well, except for the five freezing minutes I spent having a cold shower last night because he’d used up all the hot water. To celebrate my ten years in Pyrmont, the lady at the corner shop made me cabbage rolls for dinner. Loveliness in the heart of the City! Yep, Pyrmont is a great place to live. I realised this morning that there are possibly only a handful of people that call me by my actual name. Yesterday, when I wrote ‘Janine’ in my blog, it looked weird. Like I needed to spell check it or something. I get called Neen by pretty much everyone. Donna Kebabs & Aunty Liz call me Neeny. Work peeps call me Shammers, J-9 and Janinus (apart from all the managers who actually use my real name). Mum and Dad call me Janiney. As in Janiney, Peaniey, Pudding & Pie, kissed the boys and made them cry. Ian calls me Ish, Smoosh, Pot, Sauce, Squish, Babe, Wifey and sometimes Macdoog or Snooge. I hate being called Macdoog. He got it from some Knights footballer, even though he claims he didn’t. Snooge is far worse and I refuse to answer to it. As well as always being called something other than my name, I also rarely use other people’s first names. If someone’s name is long, I shorten it. If their name is short, I lengthen it. Sometimes I shorten their last name. Sometime I just add new words in. Like Ella. I could just call her Ella. But Ella Beans sounds lots better. Donna is Donna Kebabs, Don, Diddy or Doona (well, E calls her Doona). Ian is E. And from the day we got married I started to call him the Husband. I also call him the same names he calls me as well as honey, which he hates. But he is a honey. Sheela is Sheels, the Sheelster, Sheel-la-la or Mrs Google. Alissa is Lis or Lissy. Mel is Melly. Mel’s name is actually Melissa but I forget this. Someone on the weekend told me that they were in the class above me at school. I asked them if they knew Mel Williams. They asked if I meant Melissa O’Neil. I was like, ‘Melissa? O’Neil? Who the hell is that? No, I don’t know her. At which point, Husband asked me if I was on drugs. Kelly is Kel. I think she should also probably be called Kelstar because she is a star. Amy is Ames or Big A.
Kylie is Kys. In my head I sometimes call her K-dub. Her last name starts with W so it works for me but I don’t think she’d like it. Katariana is Kat or Kata. Danielle is Wapes (last name shortening works a treat). 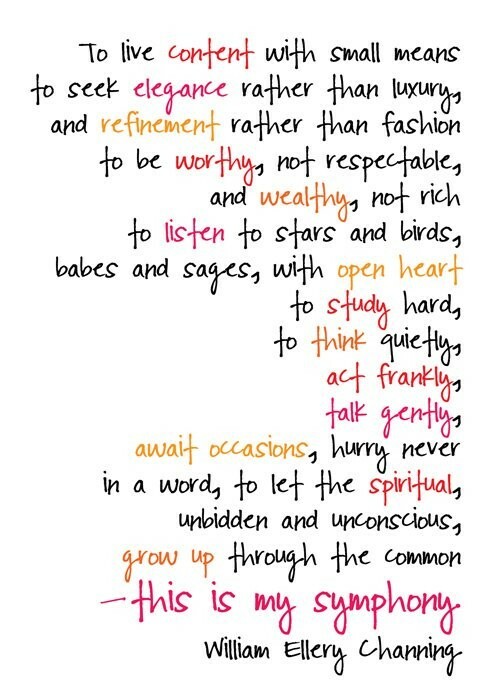 Claire is Clairey – this goes for my cousin and my friend Claire. Thane and Drew are Thaney and Drewby or Drewberry. Lisa is…..Lisa. Goodness! She and her daughter Amelia are the only two people I can think of that I actually call by their names. Apart from male friends. They seem to be different. I don’t really call them by anything other than their actual names. Instead of me going on with this list forever and a day, let’s just agree to make first names universally redundant. In my little universe at least.